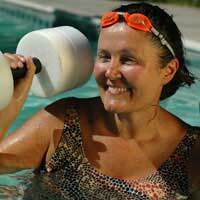 You don’t have to be a swimmer to benefit from aqua aerobics. Yes there may be times when the instructor wants you working out in depths up to your chest level, but don’t worry. Even if you do end up with a ducking, there’ll be plenty of classmates around to pull you up. Of course getting into deeper water may be a blessing for new students -men ashamed of their beer belly or women with a little too much around the waist - because it can hide a wide variety of dietary sins. The attraction of this exercise class lies, in part, in the relaxing physical and psychological effect of immersion in water. Certainly, your muscles and joints will benefit because the water is going to support them during the series of routines that make up an individual programme, so for older exercisers or those with certain medical issues, it can be ideal. But that doesn’t mean that you won’t be enjoying a good workout. Yes, the lapping water will be supportive and relaxing, but it will also be providing a great deal of resistance below the surface, so your lower body will be feeling the effects very quickly. Don’t believe it? Then try a 10-minute warm-up, walking around the shallow end of your local pool. Notice the work being done by you thigh muscles in pulling your legs through water? Like the proverbial walking through mud. But that dragging effect that water has on your limbs means they’ll be doing plenty of work. The results of this water work will mean better muscle strength, better toning, and your cardiovascular system will become more efficient. Oh yes, and you’ll be burning plenty of calories during a 45-minute session, too. In short, an aqua aerobics session offers benefits, whatever your exercise priorities are. Thanks to the cooling effect of the water, you won’t be getting all hot and bothered, either. As well as the more straightforward walking routines, an instructor may introduce squats as well as dance moves that get your upper body working. The side of the pool may be utilised as a support for leg raises while aqua dumb bells or weighted rings may be utilised to introduce greater upper body resistance. In terms of equipment, a swimming costume is all you will need to get started, along with some inexpensive water shoes that will provide good grip and, therefore, minimise balance problems during dance routines or the chances of an unexpected dip below the surface.Clothing designed to offer better support for aqua aerobics participants is available, but sticking to your existing costume is not going to seriously reduce the benefits you will receive from a session. The class may also help non-swimmers overcomes their fear of water and lead to lessons that will open up yet another avenue for getting fitter and achieving better body tone.At the very least, aqua aerobics will literally make a refreshing change from the heat of the dance studio. Make it an integral part of your weekly programme and you’ll find that you emerge from the water reinvigorated and ready for the next fitness challenge.